Specificity :Recognizes peptides and proteins phosphorylated on tyrosine residues. Cross Reactivity :Pan-specific antibody. No reaction to phosphoserine/ phosphothreonine peptides and proteins. 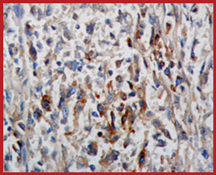 Sample Data :Immunohistochemistry analysis of human breast cancer tissue with Anti-Phosphotyrosine (anti-pY) (1:50). Scientific Background :Post-translational modification of proteins and peptides is a robust way to regulate function of existing proteins or peptides. Protein phosphorylation represents one the most abundant and important post-translational modifications of proteins. Phosphorylation on tyrosine residues in proteins is performed by a variety of tyrosine specific protein kinases in the cell which are involved in a wide variety of signaling networks. The Phospho-Tyrosine antibody detects phosphorylation on tyrosine residues in proteins and peptides.